Chinese usually prefer food hot then cold. There are exceptions like Sichuan 'liang pun 凉拌' which are salad style dishes, one of these is the well known bang bang chicken (or more correctly pronounced as 'bung bung ji' 棒棒雞). The name bung bung ji came from the way the chicken was prepared. Traditionally the cooked chicken was bashed with a wooden stick before shredding. In Chinese wooden stick is called 'bung 棒' and chicken is 'ji 雞'. Chicken for this dish is normally breast and poached. Leftover roast chicken is perfect for this dish. I have seen many westernised versions of bang bang chicken. Peanut butter is most common. Traditional bang bang chicken only use roasted sesame paste similar to tahini to make the sauce, the sauce is spicy with chilli oil and Sichuan pepper. Mung bean sheet or 'fun pei 粉皮' is commonly eaten with this chicken salad. 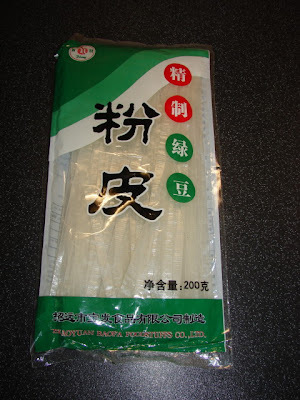 I love this it's like rice noodles but texture is slightly crunchy similar to jelly fish. This fun pei is available from many Chinese supermarkets and online store like this. Fin Pei can be in large round sheet or sliced into noodles. 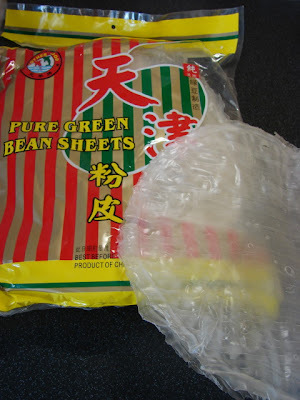 If not available can use glass/cellophane noodles. This the the sesame sauce I was using. If using mung bean sheets, follow the packet instruction cook with boiling water in a large pan till really soft for about 6 - 8 minutes. Test a bit before taking out then rinse, drain then cut into thick strips. If using glass noodles, soak with boiling water till soften, then rinse and drain. 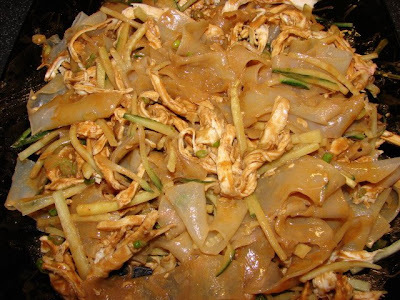 Mix mung bean sheet or glass noodles with a little sesame oil and soy sauce. If using lettuce, just cut into fine strips. Shred the chicken into fine strips. Cut the cucumber into fine strips. To make the sauce, mix the sesame paste with some warm water or stock to thin it down, then add remaining ingredients together. Taste to see if you need to adjust any ingredients. 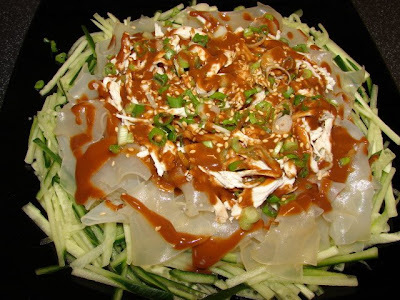 Spread the cucumber and mung bean strips (or cellophane noddles, or lettuce) on a dish. Scatter on the shredded chicken. Sprinkle sesame seeds and spring onion on top. Here is picture with everything mixed together, not so pretty but still tasty. Thanks for the info on this, Sunflower, very useful photos of green bean sheets, sesame paste, preserved vegetable. The photos of the jars are so much more useful than photos of the actual ingredient. Wine Yeast Balls here is a picture of these yeast balls and my other piccies for glutinous rice wine making. The wine is still maturing in my cupboard. 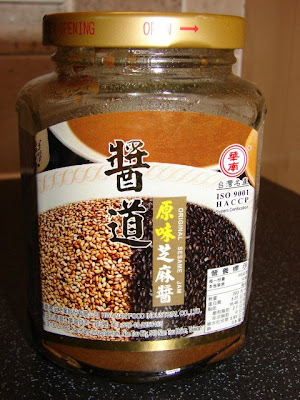 http://picasaweb.google.com/sunflower4074/MakingGlutinousRiceWine#5370641921939997698 these are available in some Chinese supermarkets, I know Lung Fung in London China Town have them for around 30p a packet. Sichuan Pickled Chillies & Pickled Chilli Paste, never seen any in Chinese supermarket anywhere in UK. You can make some yourself. Semi dried some hot red chillies for a day or two. Then prick the skin. Put into a jar with some plain white rice wine, salt and Sichuan peppercorns. Leave on the worktop for a day or two then in the fridge for few weeks before using. The paste is just mashed up pickled chillies. If you’ve read my post about Chinese ingredients I have links for most ingredients posted. http://sunflower-recipes.blogspot.com/2008/11/chinese-ingredients.html Also there is a S E ingredients post.